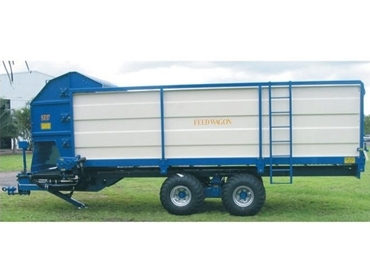 The latest addition to Gyral Implements range of silage feedout wagons is the 17.0m3 wagon which has 3 horizontal fluted beaters at the front of the machine to deliver the silage onto the side delivery conveyor. With 3 high tensile chains joined with steel channel slats, the silage is conveyed over the treated hardwood floor to reach the beaters. All of this process is driven by the hydraulic motor to a reduction gearbox allowing for speed variation and reverse. There is also a tandem walking beam axle which provides stability over the undulating terrain. The wagon also comes with an optional high trough conveyor as well as a clean square trailer body for complete discharge purposes.